Dry Eye Syndrome represents a constantly increasing diagnosis in most eye care practices. Once considered a condition limited to the elderly, it is now understood to be a condition that may affect patients of any age. Symptoms such as tearing, burning and redness often indicate Dry Eye Syndrome. While many patients attempt to persevere with these symptoms, our doctors realize that this condition may lead to contact lens intolerance, decreased productivity at work and an overall decrease in quality of life. Drs. Reto, Halscheid, Lehman and Dougherty specialize in the treatment of Dry Eye Syndrome. Because this condition often involves two separate areas of ocular disease, eyelid margin inflammation and insufficient tear production, a sequential treatment approach must be undertaken. In our practice, special time is devoted to educating patients on their condition and the various options of treatment. Non-preserved artificial tears, prescription drops, in-office procedures and even mild surgical procedures are commonly prescribed options. Additionally, patients are educated on the results of many recent studies; most of which prove the value of nutritional supplements in the treatment of Dry Eye Syndrome. As with any disease, determining a cause is always an area of focus. For many patients with Dry Eye Syndrome, the causative factor is Meibomian Gland Dysfunction (MGD). MGD is blockage or some other abnormality of the meibomian glands on the eyelids. When blockage occurs, the glands don’t secrete enough oil into the tears. Because the tears then evaporate too quickly, MGD is a leading cause of dry eye syndrome. In these cases, the treatment protocol involves reducing the inflammation and blockage of the meibomian glands. Eyelid scrubs and warm compresses may be indicated in mild cases. Because Dry Eye Syndrome is a chronic condition, in-office procedures such as Mibo Thermoflo or LipoFlow may often be the treatment of choice and offer a more lasting solution. These procedures deliver consistent emissive heat to the meibomian glands. Blockages, or lipid secretions, are softened and mobilized through gentle ocular message. Liberated surfactants and improved lipid secretions create an enhanced tearfilm. Improved corneal wetting reduces or eliminates the signs and symptoms of ocular surface disease. Thus, improving meibomian gland function is a mainstay of modern therapy. Alternatively, dry eye symptoms may be brought about by factors ranging from the use of prescription medications to diet and lifestyle. For some of these patients, the eye does not produce enough tears. In others, the tears may evaporate too quickly; this may happen if the tears are not of the right composition. In both of these situations, the tears do not adequately bathe the surface of the eye. 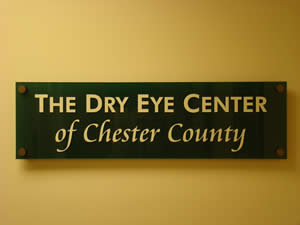 As a result, the eye may feel dry and painful. In these cases, different treatments may be indicated. Topical medications such as Restasis, Xiidra or various corticosteroids may be prescribed. Additionally, Allergan has introduced a new medical device that will provide a temporary increase in tear production called TrueTear. This is a drop-free, drug-free method of increasing tear production to your eye. The TrueTear Intranasal Neurostimulator provides a temporary increase in tear production for adults by providing a drop-free, drug-free method of tear production. Dry Eye Consultations with our doctors are designed to educate patients on their condition, and implement the most effective treatment options available. Because this condition is often chronic, a proper diagnosis and management approach is essential for long-tern maintenance.